Now they’re all finally up – I hope you enjoy them! And let me know if something is not working properly, please. Speaking of time, I made these bars in almost none, and could even get some rest on the couch, watching TV – “Jaws”, to be more precise – while the base chilled in the refrigerator. Butter a 20cm (8in) square baking pan; line with foil, allowing a 5cm (2in) overhang on 2 sides. Butter lining (not overhang); set aside. Start by making the base: whisk flour, salt and macadamia nuts in a bowl. Put butter and brown sugar into the bowl of an electric mixer fitted with the paddle attachment; mix on medium speed until pale and fluffy. Mix in flour mixture and maple syrup. Press dough evenly into bottom of prepared pan. Refrigerate 30 minutes. In the meantime, preheat oven to 180°C/350°F. Bake until set in center and pale golden, 22 to 25 minutes. Transfer to a wire rack; let cool slightly. Now, the topping: put butter and macadamia nuts into a small saucepan. Cook over medium-high heat, stirring constantly, until butter is very foamy and nuts are fragrant, 2 to 3 minutes. Add salt, brown sugar, maple syrup, granulated sugar, corn syrup and cream. Boil, stirring constantly, 2 minutes. Spread over crust. Let cool completely. Run a knife around non-parchment sides; lift out of dish by overhang. Cut into sixteen 5cm (2in) squares – I refrigerated the whole square before cutting it into bars so the caramel would be firmer. Bars can be stored in an airtight container at room temperature up to 3 days. Oh wow, these look absolutely delish! amazing blog! just found it! pretty pictures and sweet nice recipes! yum yum! 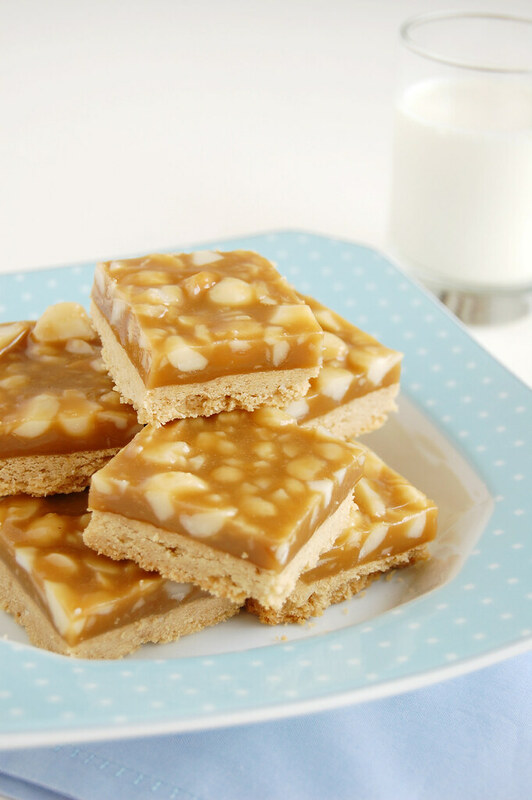 these nuts and caramel are in great connection! Lovely bars... it's a shame I don't get macadamia nuts in BsAs but I"ll try them with some other nut. Yum! I love caramel! These look to die for! 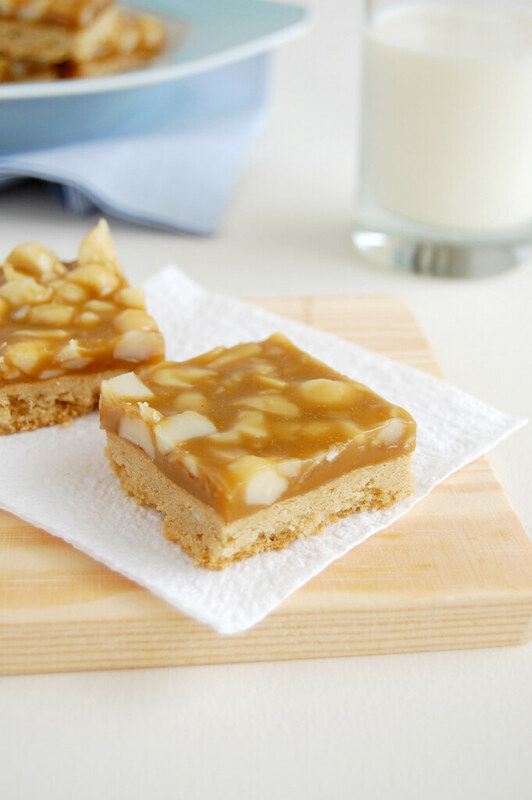 These bars look amazing...almost like maple fudge in bar form. Delicious. oh wowww! those look amazing!! everything on this blog does, and the photography is exceptional as well! Adriana, thank you for stopping by! I'm glad you're enjoying the blog! Sil, thank you! That's too bad - I'm sure these would be great with other kinds of nuts. M., thank you for stopping by! Joanne, thank you for visiting! Petra, thank you for stopping by! These bars sound so good!